A bespoke four bedroom detached family home finished to a very high specification, and situated on a delightful plot. 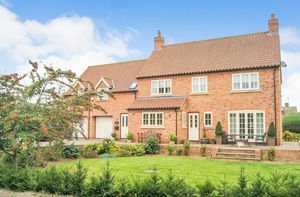 This very unique residence was completed in 2007, and in addition to the four bedrooms, which include a self contained first floor Annexe, the property has a fabulous breakfast kitchen and an excellent sized lounge. 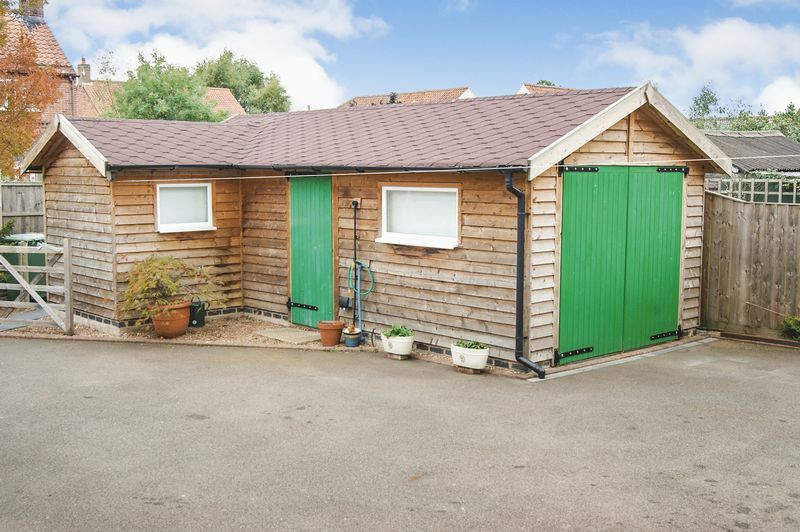 There is ample off road parking, a double garage and a timber workshop. 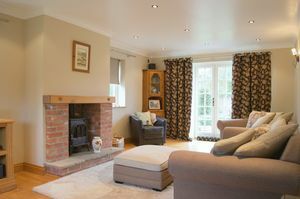 The property is double glazed, and has oil fired central heating with under floor heating throughout. 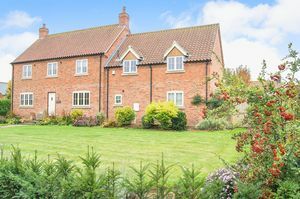 The rural village of Little Carlton is located approximately 3 miles from North Muskham, approximately 4.7 miles from Newark on Trent and approximately 8.5 miles from Southwell. 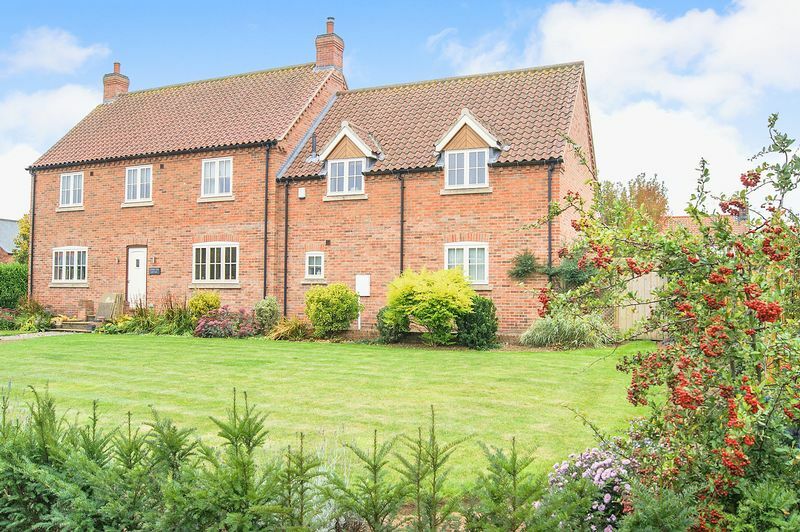 North Muskham is a sought after village with an excellent primary school, pretty church and public house. 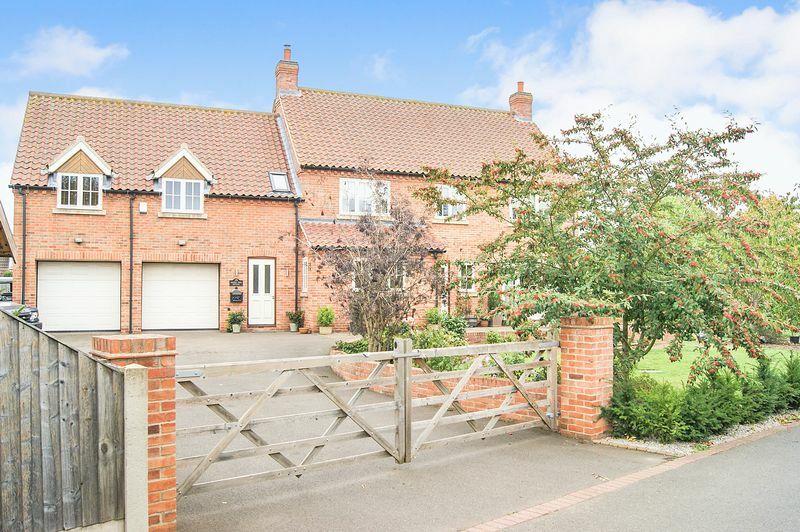 Newark, Nottingham and Lincoln are within commuting distance and there is easy access to the A1 and the A46 dual carriageways. Fast trains are available from Newark Northgate station to London Kings Cross with a journey time of approximately 80 minutes. The welcoming and spacious reception hallway has the staircase rising to the first floor, and provides access to the breakfast kitchen and lounge. 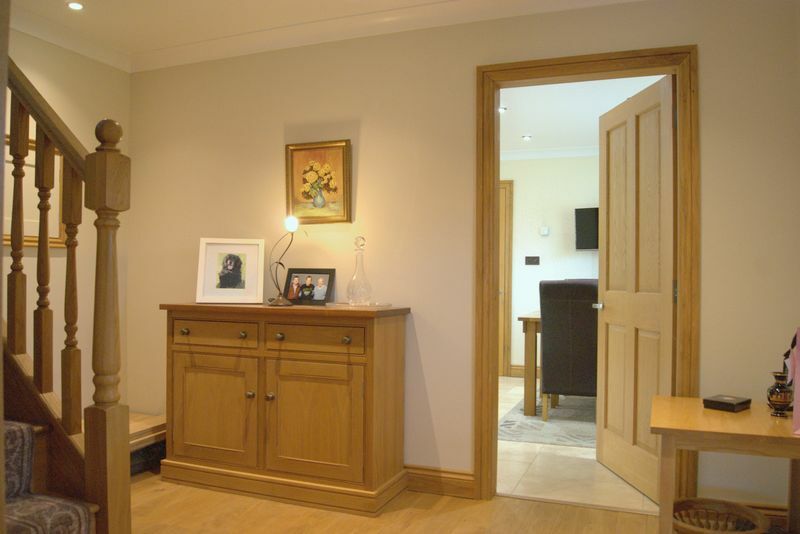 The hallway itself is complemented with solid wood flooring, cornice to the ceiling and recessed ceiling spotlights. 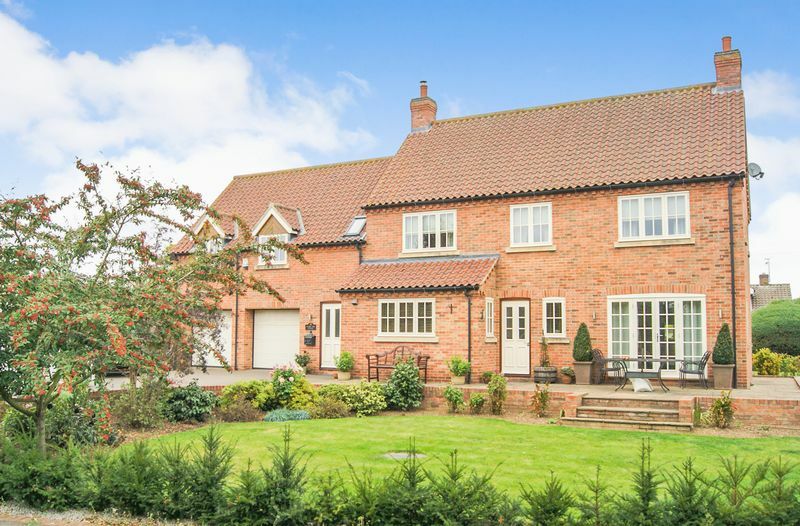 This superb sized well proportioned reception room has triple aspect windows enjoying views of the garden, and French doors that provide access out to the patio. The focal point of the lounge is the feature brick fireplace with multi fuel stove inset. The room is further enhanced with solid wood flooring, cornice to the ceiling, recessed ceiling spotlights and wall light points. 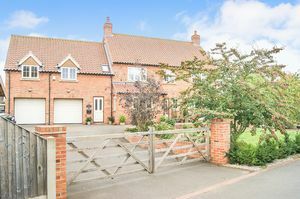 The fabulous sized breakfast kitchen is the heart of this wonderful home, and has windows to all sides enjoying views of the gardens and driveway. 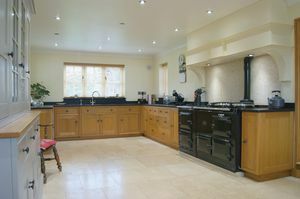 The kitchen itself is fitted with a very comprehensive range of bespoke base units, with contrasting Cambrian black granite work surfaces and matching splash backs. There is a one and a half bowl sink, and an integrated wine cooler and dishwasher. The Aga range cooker is included within the sale. 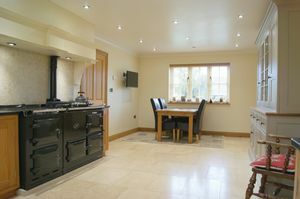 The kitchen is further complemented with a limestone floor, cornice to the ceiling and recessed ceiling spotlights. From the kitchen a half glazed door leads through to the utility room, and a further door leads through to the annexe hallway. The utility room has a window and a half glazed door to the rear elevation, and is fitted with base units with contrasting Cambrian black granite work surfaces and splash backs to match those of the kitchen. There is also a sink, space and plumbing for a washing machine, limestone flooring, cornice to the ceiling and recessed ceiling spotlights. The annexe hallway has a further door to the rear elevation leading out to the driveway, the staircase leading up to the annexe bedroom, and a further door to the ground floor shower room. There is also a personnel door into the double garage from the annexe hallway. The hallway is complemented with limestone flooring that flows through from the kitchen, together with cornice to the ceiling and recessed ceiling spotlights. The shower room has an opaque window to the front elevation and is fitted with a walk in shower cubicle with mains shower, pedestal wash hand basin and WC. The shower room has a limestone floor and part ceramic tiled walls, a heated towel rail, a shaver's socket and an extractor fan. In addition there is cornice to the ceiling and a ceiling light point. 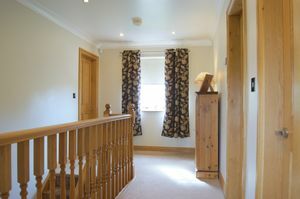 The staircase rises from the annexe hallway to the first floor annexe suite, which has dual aspect windows to the front and rear elevations. 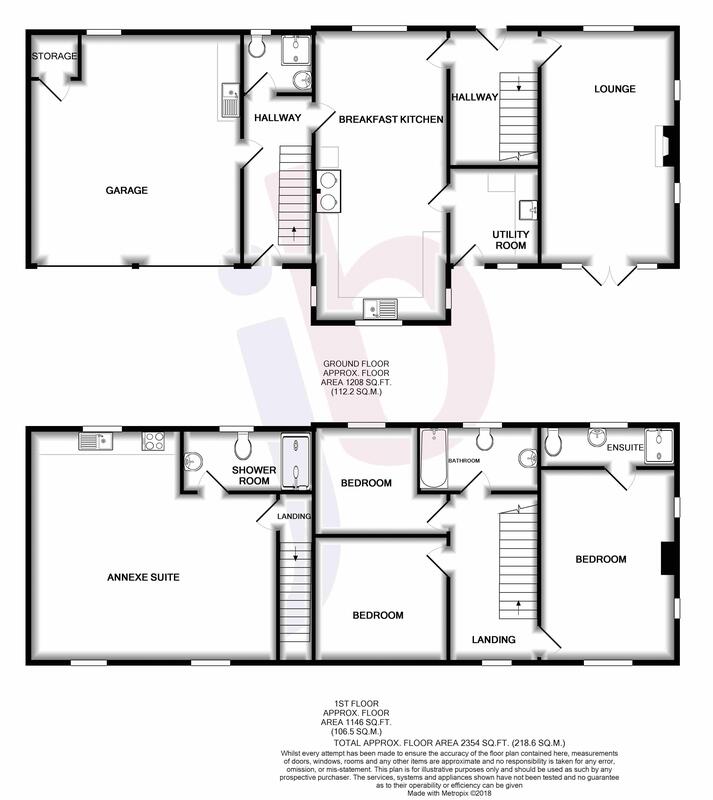 This fabulous self contained suite comprises a bedroom with open living space, which in turn leads to the well fitted kitchen area. The kitchen area is fitted with a range of base units, complemented with granite work surfaces and splash backs. 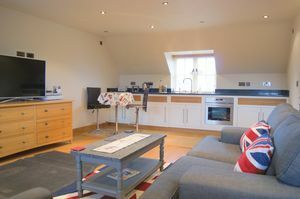 There is a one and a half bowl sink, and integrate appliances including an oven, fridge and ceramic hob. 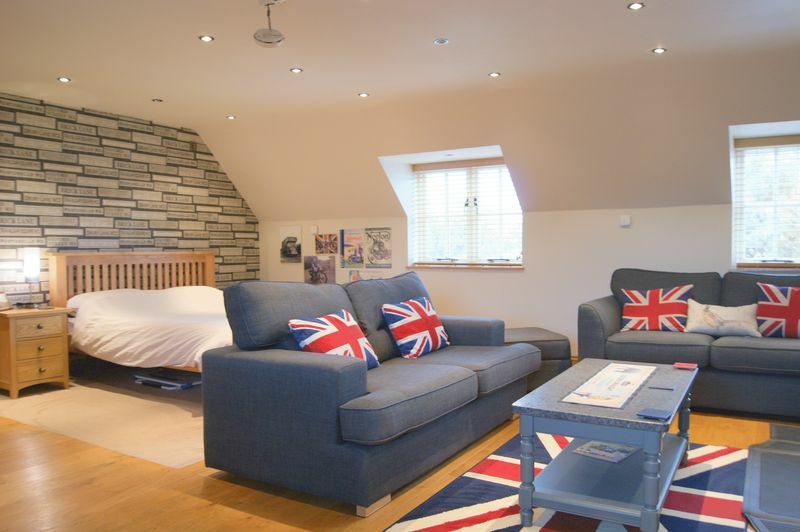 This superb annexe suite is enhanced with a combination of solid wood and limestone flooring. 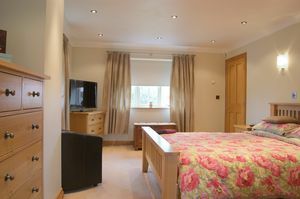 The room also has recessed ceiling spotlights and a door providing access to the en-suite shower room. The en-suite shower room has an opaque window to the front elevation and is currently being re-fitted with a double width shower. There is also a vanity unit with wash hand basin inset and storage beneath, and a WC. 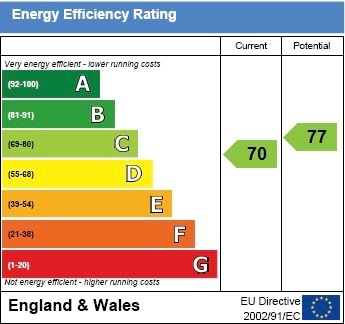 In addition there are recessed ceiling spotlights, a shaver's socket, an extractor fan and a heated towel rail. As previously mentioned, the staircase rises from the reception hallway to the spacious first floor landing which has a window to the front elevation and doors leading to three bedrooms and the family bathroom. Access to the loft space is obtained from the landing. 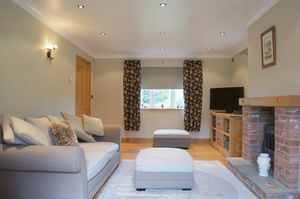 The landing is complemented with recessed ceiling spotlights and cornice to the ceiling. 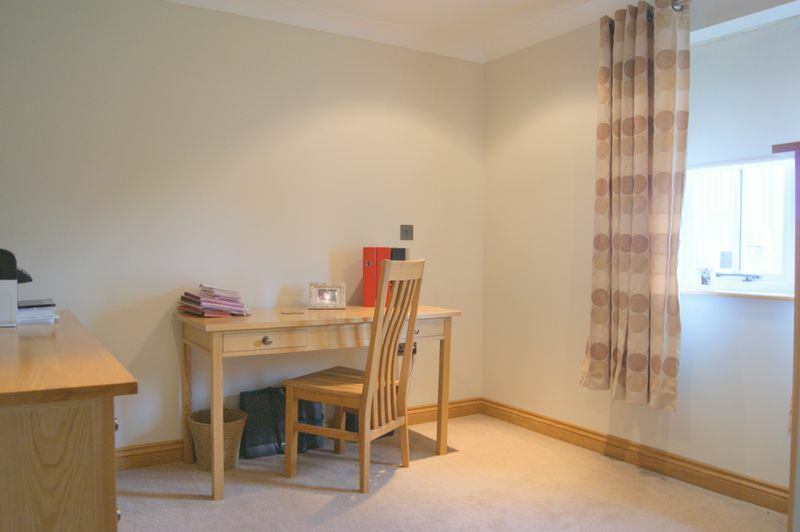 An excellent sized double bedroom with dual aspect windows to the rear and side elevations. 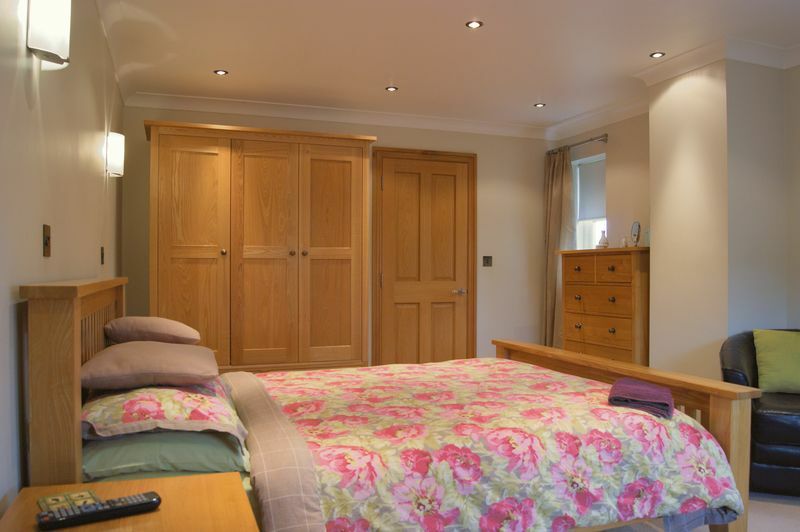 This bedroom is enhanced with cornice to the ceiling, and both recessed ceiling spotlights and wall light points. 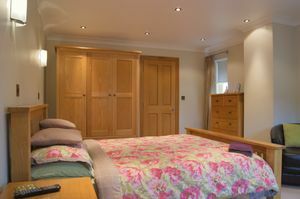 A door leads into the en-suite shower room. This en-suite has an opaque window to the front elevation and is fitted with a walk in shower cubicle with mains shower, pedestal wash hand basin and WC. 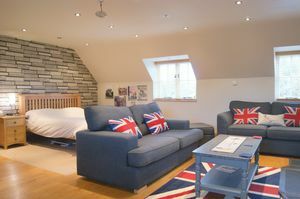 The room is complemented with a limestone floor, wall tiling, cornice to the ceiling and a ceiling light point. There is also a shaver's socket, a heated towel rail and an extractor fan. A further excellent sized double bedroom, having a window to the rear elevation overlooking the garden and driveway. 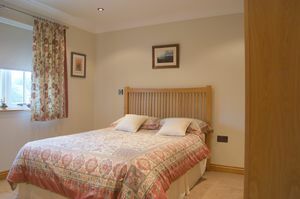 This bedroom also has cornice to the ceiling and recessed ceiling spotlights. Bedroom three is also a double bedroom, with a window to the front elevation, cornice to the ceiling and recessed ceiling spotlights. 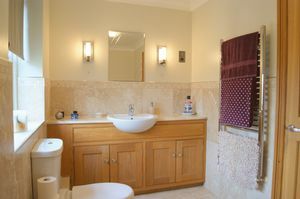 The family bathroom has an opaque window to the front elevation and is fitted with a white suite comprising bath, vanity unit with wash hand basin inset and storage beneath, and a WC. The bathroom also has a limestone floor, wall tiling, both wall and ceiling light points, an extractor fan, a shaver's socket and a heated towel rail. 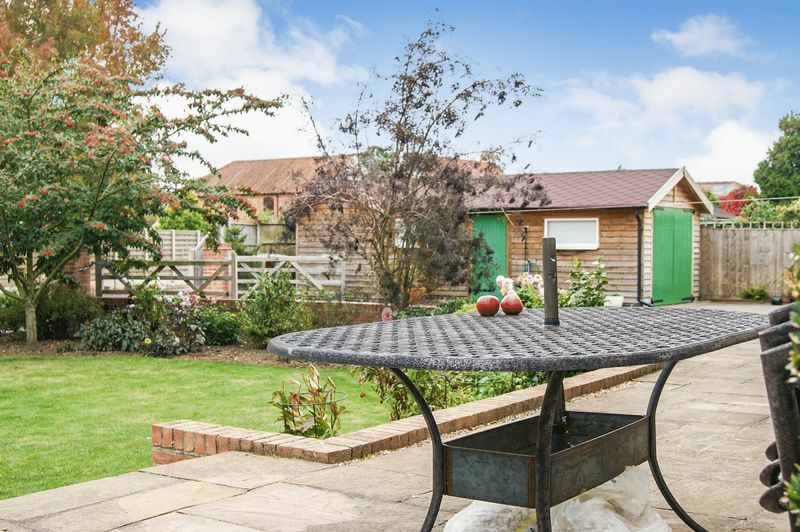 Cherry Tree Cottage stands on a delightful plot, with sizeable well maintained lawned gardens on three sides. 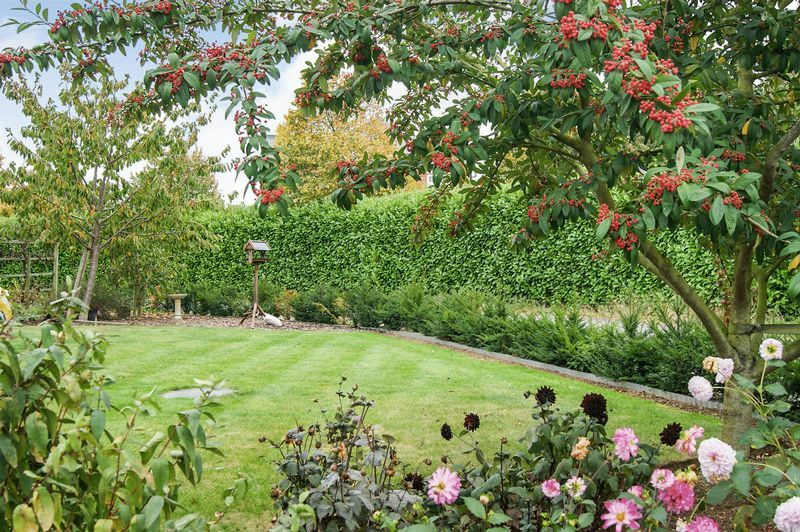 The gardens contain a wide variety of mature shrubs, plants and trees, and there is a designated vegetable plot. 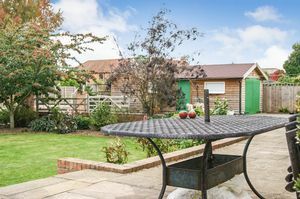 There is a raised patio area situated adjacent to the rear of the property which provides an ideal outdoor seating and entertaining space. 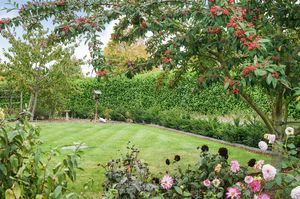 Next to the patio area is the sweeping driveway which is accessed via twin five bar gates, provides off road parking and in turn leads to the double garage. This bespoke workshop has two timber doors to the front elevation, a personnel door to the side, and two windows looking back on to the driveway. The workshop is equipped with both power and lighting.